The word Kinesiology comes from the Greek word kinein, to move and ology meaning studying. 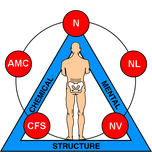 Kinesiology addresses physiological, mechanical, and psychological mechanisms. You can major in Kinesiology at universities, and earn a degree for it. Another type of Kinesiology is AK which stands for Applied Kinesiology. AK is a type of kinesiology where you use a muscle reflex test and is used as a healthy care, or therapy. At our clinic, we provide the AK Kinesiology where you can "ask" your body anything. Body pain? Stress? Decisions to make? There is so many things you can use kinesiology to find the answer!